Start your amazing holidays with the arrival at Paris, the most stylish city and the capital of France. Upon arrival, check into the pre-booked hotel and take some rest. Paris is Europe’s fantastic city which has something for its each visitor. Museums, theatre, open spaces, historic monuments, shopping avenues, happening markets etc everything here is stunningly beautiful and contributing in making it one of the most happening cities in the world. Enjoy a visit to some interesting attractions of the city which include a visit to the Golden Dome of the Invalids, The great watch of obelisk of the Place de la Concorde, The old bridge of Pont Neuf etc. Return back to the hotel to relish dinner and overnight stay. After breakfast proceed for the half day city tour of Paris which provides you an opportunity to discover the history and rich heritage of this trendsetting city. 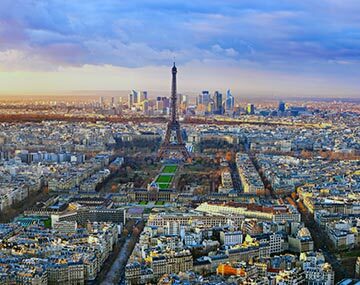 Visit the top attractions of the city which include Champs Elysées, Arc de Triumph, Notre Dame de Paris Cathedral, Louvre Museum, Saint Germain des Prés, Pantheon, Palais Garnier etc. Followed by this enjoy one hour cruise along the Seine River and see all the sights along its UNESCO-listed river banks. It runs through the very heart of Paris and provides an unforgettable experience to its visitors. Then proceed to visit either the Eiffel Tower or Montparnasse Tower to admire the superb views over Paris. Enjoy dinner and overnight stay at the hotel. In the 3rd morning of your Europe trip package from India explore the city of Paris by visiting its amazing attractions like Disneyland Paris, Musee Rodin, Pont Alexandre III, Palace of Versailles etc. You can also go for optional tours or walking tours, shopping etc to enjoy your day at leisure. Enjoy dinner and overnight stay at the hotel. Post breakfast checkout from the hotel and get transferred to the railway station to board your super fast TGV to Basel. From here get the connecting train to reach Interlaken. It is often referred as the Top of Europe. It lies in the Bernese Oberland between Lake Thun and Lake Brienz is a premier holiday destination for visitors across the world. Interlaken is the central town offering easy access to the entire Bernese Oberland offering stunning views of its surroundings. Upon arrival, check into the pre-booked hotel and enjoy rest of the day at leisure activities. Explore Interlaken’s Hoheweg Promenade is a boulevard stretching all the way from Interlaken-west to Interlaken-Ost boasts the abundance of hotels, restaurants, boutiques, souvenir shops is a meeting place to stroll or pass by. Return back to the hotel for the dinner and overnight stay. Post Breakfast depart for an excursion to Jungfraujoch. This memorable rail journey to the Jungfraujoch through the rock of the Eiger and Monch offer stunning views of the surroundings and is an incredible experience for its visitors. Jungfraujoch is situated at 3454 meters is the Europe’s highest altitude railway station and offer its visitors high –Alpine wonder world of ice, snow and rocks. Also visit the Ice Palace the beautiful display of sculptures and breathtaking views of Aletsch Glacier from Sphinx Terraces etc. Return back to the hotel for dinner and overnight stay. After enjoying scrumptious breakfast, check out from the hotel to proceed towards railway station to board a train towards Lucerne which is known as the gateway to Central Switzerland. Upon arrival, check into the pre-booked hotel to take some rest. Lucerne is embedded with panoramic mountainous panorama and is an ideal starting point for many excursions to Central Switzerland. Visit the Chapel Bridge one of the oldest wooden bridges and landmark of Lucerne, Swiss Museum of transport or boating on Lake Lucerne etc. Return back to the hotel for dinner and overnight stay. On The 7th day after breakfast a memorable experience awaits you. Depart on an excursion to glacier paradise of Mount Titlis by boarding a train from Lucerne to Engelberg Station. From here ride an aerial cableway to the summit of Mt. Titlis situated at the height of 10,000 ft. It is decked with many snow-themed attractions like Glacier Cave, Ice Flyer Chairlift, Titlis Rotair gondola and Cliff Walk the highest suspension bridge in Europe. After spending your day in the most scenic surroundings return back to the hotel for dinner and overnight stay. Post breakfast check- out from the hotel to board a train to reach Zurich. It is one of the largest cities of Swiss Confederation and is the financial capital of the country which is a home to headquarters of various national and international organizations. Upon arrival, check into the pre-booked hotel and freshen up. Later on, enjoy a visit to striking attractions of the city like Kunsthaus the art gallery, Rietberg Museum, Bahnhofstrasse Street featuring fashion boutiques, street cafes, departmental stores, Altstadt with its art galleries etc. Return back to the hotel for dinner and overnight stay. On the last day of Europe Travel Package, check out from the hotel after morning breakfast and proceed towards the airport to board a flight to the onward destination or back to India with fond memories of the trip. The continent of Europe is mesmerizing. It is full of scenic beauty, opulent castle and palaces, dazzling artistic beauty, stunning coastal regions, rich cultural heritage, amazing culinary diversity and energetic nightlife etc. It is some of the reasons that attract visitors to come here again and again and enjoy best holiday trips of their life. If you have selected a Europe holiday package and looking forward to your travel related needs then your search surely ends at BookOtrip which is your trustworthy travel partner. We offer the most diligent services to our esteemed customers in terms of flight bookings, best deal hotel accommodations, car rentals, travel insurance etc so that you can enjoy best holidays of your life in any corner of the world. High Season, Trade Fair & Special Event surcharge not included in the above price. Please check with operations team for quotations with exact dates of travel. I had gone to paris. What a stylish city it is. Oh my God Finally I saw the Eifelll Tower. It happens to me as though it was a dream. Thank you so much Bookotrip.